I went to the casino after work the other night to unwind with a well-needed cigar and who do I see walking near the center bar but none other than the golden-haired, occasionally alcoholic, former British Open champion, John Daly. I did a double take to see if it was really him and then I thought to myself who the hell else has hair that color. I told my cigar-smoking partner in crime that John Daly just walked by. “John who?” he replied uncaringly. I need to get new friends. 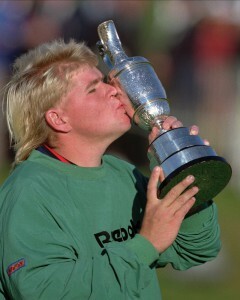 “John Daly!” I said, turning my head in every direction to see where he had gone. “The Former British Open Champion!” Not a word from the Divine Mr. Monroe, who took off to look for the next lucky slot machine that would kindly him off. I immediately wondered what Daly could be doing in town, strolling through the Hard Rock at 4:30 on a Tuesday morning. Then I realized the Valspar Innisbrook Pro-Am was in town, an otherwise meaningless, early-season PGA Tour stop. Damn, I thought, a missed opportunity for a snapshot and to talk sobriety, shanking golf balls and what the two might have in common. To make matters worse, I’ve been holding on to the picture below for months with the intent of hosting another caption contest. 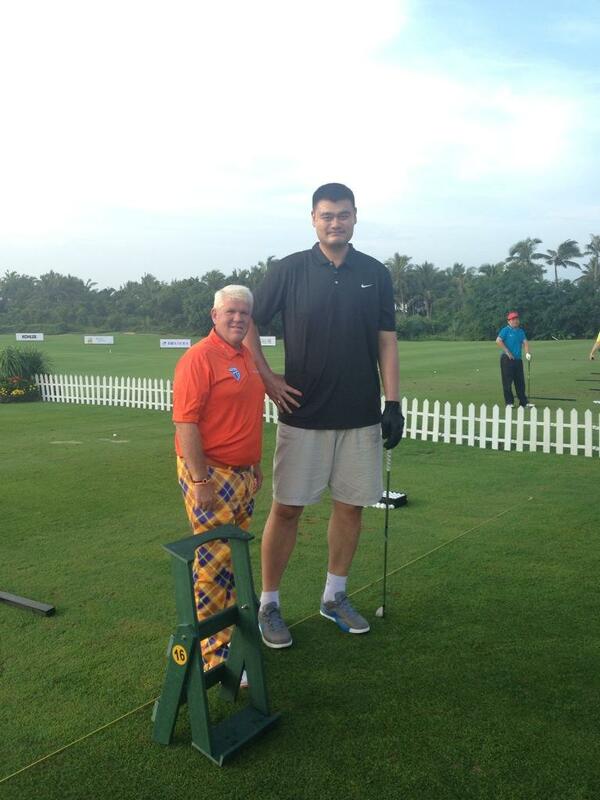 Allow me to present John Daly and Yao Ming on the driving range for some godforsaken reason. I could have put this photo next to the one I had taken at the casino, which would have made for a doozy of a contest but alas, my consideration of a celebrity’s personal privacy overrode any decision to launch off my bar stool to bother the guy. So since I was slow on the uptake, I figured I’d give away a t-shirt as a result. The best caption of the two athletes below will receive a brand spanking new SportsChump t-shirt to wear the next time they don’t see John Daly. This entry was posted in Featured, Life of Sports Chump, Tee Box and tagged British Open, Caption Contest, Hard Rock, John Daly, PGA, Yao Ming by Chris Humpherys. Bookmark the permalink. Dude, that guy’s a monster. Yao Ming’s kinda frightening too. Yao Ming plays golf ? Daly supplements his menial income from the PGA Tour by wearing stupid outfits and looking for another wife . He’s tried Christian Mingle ____ no luck , Now he’s looking to see if Yao can “hook him up ” with a female relative . Cowboys’ great , Michael Irvin is questioning the team’s owners as to their reason for letting DeMarco Murray walk. Shouldn’t the Hall of Famer be questioning the fact the Jones’ family still own the team and why Jerry Jones was named NFL Executive of the Year ? I’m pretty sure I could take Yao in golf, Al. Although I imagine that would be an interesting golf cart ride. One would think he’d have to have one custom made, right? The guy’s like 7’7″, isn’t he? I could totally rock pants like that. I think I just saw them on the sale rack at my local Steinmart. Yea, Tree, that didn’t get much love. Perhaps a photo of me and Daly getting soused on Irish whiskey at center bar would have done better. That’s okay, though. I have a follow-up caption contest that’s sure to draw more traffic.